Operating stores in the area for over 90 years has given us insight about the values of the people we serve. 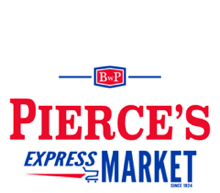 Honesty, community involvement and pride in what we do is what you will find at BWP Pierce’s Express Market. Our goal is to offer you exceptional service and quality products at a reasonable price. how we can be of help, or tell us how we’re doing. We appreciate hearing from you! Since we sell items that require purchasers to provide a valid ID to show proof of age of 21 years or older, we do not sell our products over the phone or by the internet. We cannot ship purchases either. REQUESTS: Have an item you would like to see us carry? Visit our New Items page and send us the details about it. EMPLOYMENT: Interested in joining our team? Visit our Employment page to find current openings.